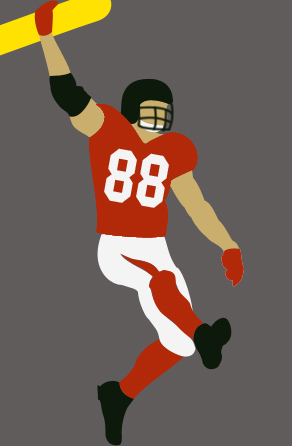 Another night of work completed (11 hours so far) on what will surely be the best infographic about an NFL player I have ever made. Tonight I spend a lot of time looking at stats about other NFL Tight Ends. I wanted to find the best way to show how much of a stand out career Tony has had compared to many of the legendary Tight Ends; Ditka, Winslow, Sharpe & Newsome among others. I also wanted to compare him to today’s best Tight Ends (Graham, Gronkowski, Finley, etc.) to show just how much work they would have ahead of them if they wanted to catch his records. Hint: They have a long way to go. The Tight End position is an interesting one because of the dual blocking & receiving responsibilities – I’m learning a lot about the history and evolution of the role as I dig through the stats. That is one of the joys of digging into a new set of data – learning the context around it and how the two combine to tell a story. I’ll probably be finishing up next week. 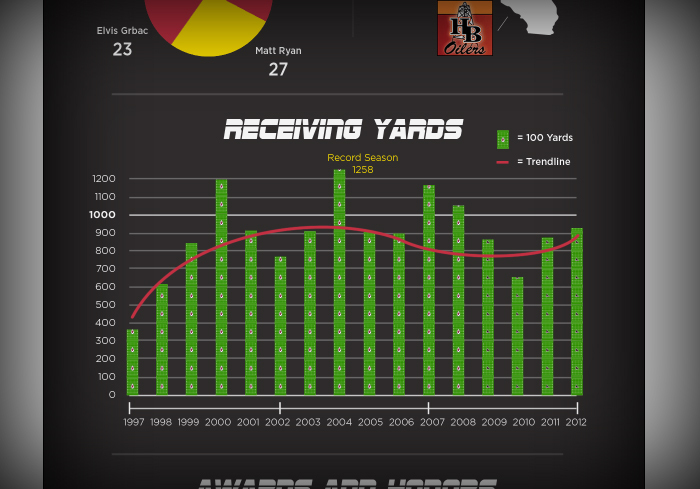 In the meantime, here is another preview – this is the chart showing yards receiving per year. And this is the Tony G icon I am working on. Pretty stoked it actually looks like a human despite the simplicity.